Every online pokie producer has an Ancient Egypt themed game – and NextGen are no exception. A While on the Nile has the classic five-reel setup. You’ll find familiar sights like scarab beetles, Pharaohs and Cleopatra on the reels. This is one of several Egyptian pokies in the NextGen range. If you enjoy this one, you might also like Cleo’s Wish and Ramesses Riches. You’ll find the standard picks game plus free spins bonus in A While on the Nile. Both have big-win possibilities. Add in the optional Super Bet with wild multipliers, and you’ll find plenty of action is possible. To the left of the reels you will see an icon saying, ‘Super Bet’. When you click this a line of multipliers appears above it. You can choose anything from 2x to 10x. This will apply to any wins which involve the Pharaoh wild symbols – which appear stacked on reels 2, 3 and 4. As you up the multiplier, you’ll pay more for each spin. While this increases the variance, it is a great way to add some potential for mega-wins. Brightly coloured beetles appear on reels 1, 3 and 5 only. These trigger a picks game when you get all three on the same spin. You’ll see the beetles come to life – performing back flips. Next more beetles appear, scuttling over the reels. The entire 5×4 grid then changes entirely to beetles. This is a simple bonus. You click on beetles, which award cash prizes based on the size of the triggering bet. You keep on picking and accumulating wins until you hit one which says ‘collect’. A green gem symbol will trigger the free spins bonus. These can be seen on the middle three reels only, and again you need all three in a single spin. There are only five free spins each time you trigger – though these can be retriggered during play. The jewels will become extra wilds during your free spins. If you added a win multiplier using the ‘Super Bet’ they will become even more effective. It is also possible to trigger the scarab picks game during your free spins. 50 lines will give you plenty of opportunities to trigger line wins in this high-action game. Pharaoh wilds appear on the middle three reels in long strips. This means one or more of those reels will often be completely wild. Your biggest wins will come this way. It is possible to trigger all 50 win-lines in a single spin – more than making up for the smaller individual prizes. Cleopatra holds the top paying spot. This symbol shows a smiling head of the famous ruler. You’ll get 1000 coins for five of a kind. Next comes the infamous Eye of Ra (300 coins for five), a stone tablet showing an ancient Egyptian spinning a slot (200 coins), and a staff with coins (200 coins). Playing card symbols have been given an angular Egyptian -style makeover – those are filler symbols which make up your smaller wins. NextGen have made this pokie clean and clear – though not eye-catching compared to some games in their range. You’ll see ancient temples around the reels, with a crisp blue sky above. There are some quirky animations when you trigger wins. My pick is the Pharaoh. When you win with this wild, you’ll see him smiling and ‘fish-bumping’ from the reels – showing your wild multiplier. The jumping scarab beetles are also entertaining. Drumming sounds play for each spin. When you trigger wins, they are accompanied by jingles which sound suitably ancient! You can play this poker machine on a desktop or mobile device. For the mobile version, the spin button is replaced by a large arrow to the right of the reels. Should You Spend a While on the Nile? 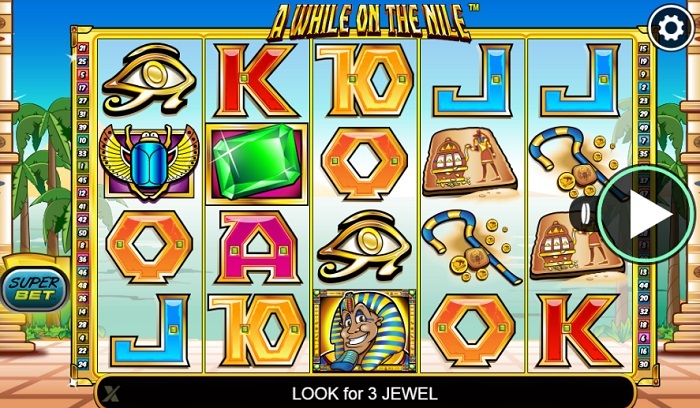 For fans of the many Ancient Egypt-themed online pokies – A While on the Nile from NextGen Gaming is a solid option. It is not graphically spectacular, though there are enough small animations to bring it to life. It is possible to up the intensity levels considerably with the bonus bet, though you’ll pay more for each spin. The picks game is simple, and the free spins bonus fairly short. Making up for this, both of these features give you plenty of opportunities for bigger wins.